Scarlett, 1979, mom to Ellie (2009), Sam (2011), Hosanna (2013) and Brady 7/18. (married to Scott Broughton). After Lee, I attended UGA for two years, then transferred to UF and got a degree in Bus Ed. (I pull for the Dogs except when they play the Gators)! Married my Finance Professor from UF, John Stewart, in '72 and moved to Orlando where I have lived ever since (in the same house)! He and I owned and operated Southern College where we wore many hats (teachers,administrators,janitorial services). Glad when we unloaded that! John died of brain cancer in 1984 when our children were just 5 and 9. I then worked as Admin. Assistant for Good Samaritan Mission Services for 20 years. In 1989, married Richard who had three grown children. Today I enjoy spending time with my family, traveling, Church work and my three part-time jobs -- flower arranging, "Bou Lady" at Stein Mart (love that discount!) and working in my friend's boutique. The majority of my energy goes into helping with our two grandsons--who are such a joy! Following our 30th Reunion, five Class of 68er's decided life is too short and began having our own annual mini-reunions. Fellow "ladybugs" Gay Rawlins, Suzanne Strickland, Timmy Linning, Linda Utsey and yours truly have a blast once a year and talk about the old days and a lot of you!!! 2013 update: just sold my residence of 40 years and am living with a dear friend while having some renovations done to my new digs. My son, daughter-in-law and two grandsons just moved to CA --so lots of transitions lately! 2018 Update:: My beautiful daughter, Scarlett married for the first time one year ago at the age of 37. Having prayed for many years to be a wife and mother, God graciously answered all our prayers in the person of my now son-in-law, Scott Broughton. Scott’s wife had sadly succumbed to cancer at the young age of 36, leaving behind three precious children, ages 2, 4, and 6 at the time. Since Scarlett lost her father at age five, we believe God knew she would be uniquely qualified to understand what these children were going through, and He hand-picked her to step up and be a mom to these precious children. As if all of that was not enough blessings on our family, lo and behold, now Scarlett is expecting baby #4 for them (her first biological) and grandchild #7 for me! Baby boy due in 7 weeks! Now after all that bragging, I also share some sad news. Four months after Scarlett’s wedding, my son and his wife announced they were splitting up after 18 years of marriage. Nothing hurts quite like seeing your own children and grandchildren in such pain. I know many of you have experienced similar happenings in your own families, and you know of what I speak. So thankful this world is not our real home and one Day there will be no more pain or sorrow! I look forward to reconnecting with my fellow Class of ‘68 mates! Until then, God bless! My favorite school memories revolve around Gamma Hi-Y. What girl wouldn't love to be surrounded by 36 guys at least one night a week? I also cherish fun times in 1st period Humanities with Faye Smith and all classes with Col. Sanderson! Remember shaking in my weejuns (!) everytime I walked into Big Dot's Chemistry Class. Carol Ann Gushanas Brannon has a birthday today. 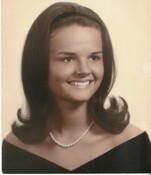 Carol Ann Gushanas Brannon updated profile. View. Carol Ann Gushanas Brannon added a photo to profile gallery. Carol Ann Gushanas Brannon added a comment on Profile. Graduation Photo. I can't figure out how to reduce it and place it up in the right corner like some of you have managed to do! May 31, 1969. I was maid of honor at my sister, Lu's wedding. April 26, 2008. My daughter, Scarlett, is her cousin's (Lu's daughter) maid of honor. Fun times! Richard & I in Seattle en route to Alaska.